As we came up out of our storm shelter and sat down in front of the TV we began getting news. One coworker's kids were at Briarwood Elementary...but she hadn't heard from them. 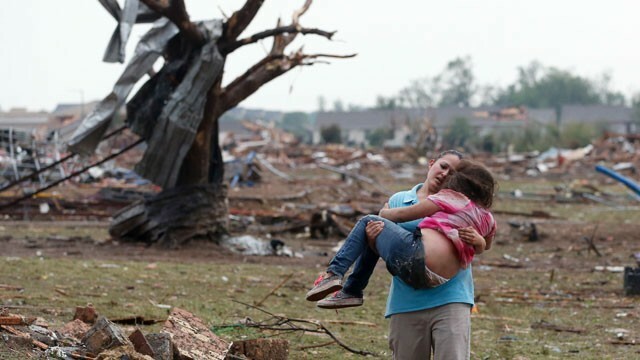 She was at work with Matt watching the storm, not knowing if it hit her kids or her home. Another coworker's boys were in the Warren Theater--they were OK but temporarily trapped. A friend of ours was in a store with her husband and baby and taking cover in the freezer section...we hadn't heard from them. Our good friends Jayson and Melissa found out their friend who is a teacher at Plaza Towers Elementary was okay, but trapped. Neighbors were pulling neighbors from the rubble before first responders could get there. A house caught fire and burned to the ground--no vehicles could get through the debris to put it out. A medical center was hit, and they had put the doctors in the walk-in freezer, knowing their skill would be needed when the storm passed. The rest of the staff and patients took refuge in the cafeteria--including a woman who was in labor and dilated to 9cm. The focus quickly turned to the two schools, and rescuing teachers and kids trapped there. We watched in horror, not knowing what to do. There was an influx of help crowding the area, lines were miles long to drop off donations. All we could do was pray. All kids at Briarwood were accounted for, and that coworker's home was only mud spattered, not damaged. The Warren Theater had stood like a rock in the sea of destruction--everyone inside was uninjured and the building itself only sustained minimal damage. Our friend and her husband and baby were okay, but the store they own was ruined. The teacher was able to get out--with all her students. They had been in the hall, but apparently she didn't feel right about that and took them all into the bathroom. We found out a coworker from Hobson's who is pregnant and due any day lost her home. A coworker from MACU lost his home as well. 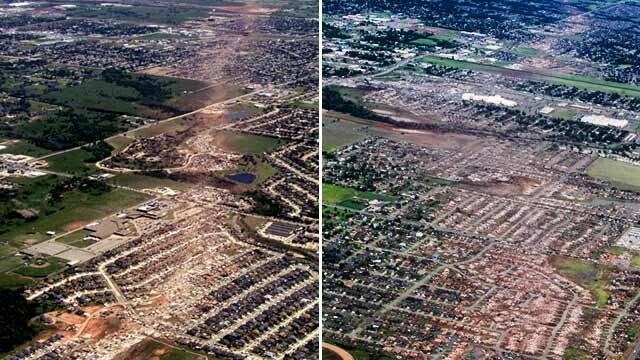 In all, 1,200 homes were destroyed. Leveled. Gone. And 12,000 homes were damaged. This path continues for 17 miles. 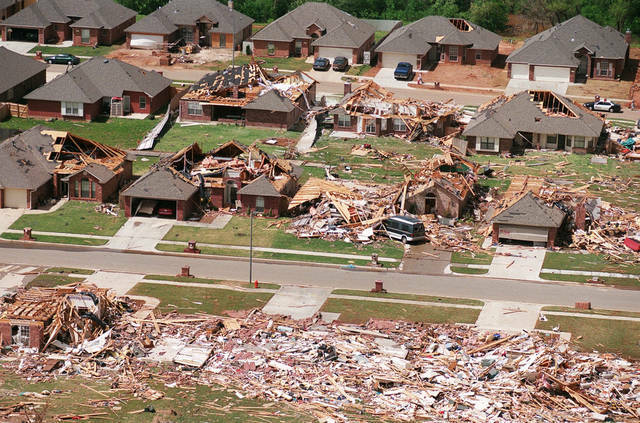 Looking at the destruction, you could see this tornado was a "foundation sweeper." How anyone could have survived was a miracle. Through the week, stories emerged. A Vietnam vet and his wife who had a 12 person shelter opened it up and were able to get 22 people and 3 dogs in. We knew of one woman who huddled in her bathtub with her kids, and they felt the tub lift from the floor, rotate, and set back down. Their tub was the only one left on their block. People who were inside in-ground shelters could feel them rocking in the ground from the force of the wind. Teachers who shielded their students with their own bodies as debris fell on top of them. The man who is like a grandpa to his 6-year-old neighbor racing to the school to find him, and wearing an expression you hope you never have to. When we went down to help with cleanup last Saturday, we talked to a woman who's pregnant daughter had been inside the house when it hit. They had been listening to the news and the tornado had been tracking more northeast. When the newscasters gave the cross streets it was at, she assumed it was heading north of her. She had been talking to her neighbor outside when they saw it at come to the end of their street. The storm turned and headed directly east. The neighbor ran inside and made it to his shelter moments before hit house was hit. The daughter ran to her house but only made it to the bottom of the stairwell. In the entire block, the only part of any house left standing was the one, white, unblemished door that was in front of the stairwell. Her boyfriend sped to help her, ignoring a police officer following him with flashing lights. He dug her out and she emerged with only a few scratches. The neighbor said it took him 30 minutes to dig out of his shelter, it was so covered with rubble. And after a few hours it was entirely filled with water from broken water pipes. That was a reality we had never considered before. 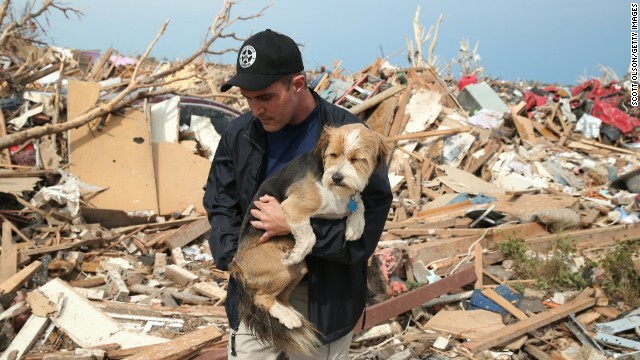 You may have seen the video of the woman describing being in the storm with her dog, and while she made it OK, she didn't know where her dog was...only to have the news reporter spot the dog in the rubble. Veterinarians were taking in animals and treating them for no cost, finding temporary housing for them until they could be reunited with their owners. And there were the heartbreaking stories too. Twenty-four lives lost, including ten children. What was thought to have been the safest place at the school--the basement--turned out not to be. One man was running to his shelter, tripped and fell and hit his head--the tornado didn't even touch his home. Looking at the destruction, however, it is amazing that the toll on life wasn't greater. Another heartbreaking dimension was that the day after the storm another one blew in. Though not tornadic, this one dumped rain and hail on recovery efforts, and soaking belongings exposed to the sky. Stuffed animals, photos, clothing, everything was getting drenched. On the Saturday after the storm, Matt, my mom and I donned our boots and gloves and headed down to help people sift through the rubble and recover anything salvageable. But you'll have to wait until tomorrow for that one. To see the widespread amount of damage, Google released a map showing the path of the tornado. When you zoom in on the affected areas, you begin to get a sense of the devastation. Wow. Thank you for sharing this. There just are no words to describe my reaction to something like this. I am glad you and your family are safe. My prayers go out to those trying to put their lives back together.